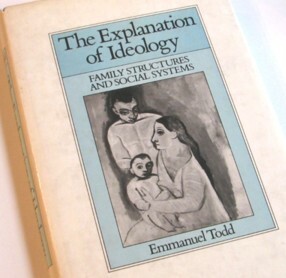 Regulars here, or for that matter there, will know that I have for many years now been at enthusiastic fan of the French historian and social scientist Emmanuel Todd. In recent years, this enthusiasm has at last started to become a bit more widespread. Two of the world’s most important Todd-enthusiasts are now James C. Bennett and Michael J. Lotus. Quite a while ago now, they sent me an email flagging up a piece they had contributed to Hungarian Review, which contains some interesting biography about Todd, and about how his own particular family history contributed towards making him into the historian of the world that he later became. Todd developed this grand theory, about how literacy triggers particular sorts of political upheavals in particular places, depending on Family Structure, and then when the political dust has settled fuels economic development, But what got Todd thinking about all this? According to Bennett and Lotus, the starting point was: How Come The French Communists Are Doing So Badly And Never Seem To Do Any Better No Matter What They Try? 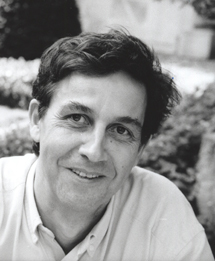 He was the product of an extended family of French Communist Party activists and journalists, and grew up hearing his father and relatives arguing around the kitchen table. Anglo-Americans had tended to regard the French Communist Party of that era as formidable, successful, and continually on the verge of seizing power. From the inside, Todd grew up hearing his family lament the eternal failure and futility of the Party. (He left the orthodox Communist movement quite early, and in fact was one of the first scholars to predict, in 1976, the coming collapse of the Soviet system.) For some reason, the Party was well established in certain regions, and completely without support in most others. The Socialists were dominant in others, and it was noticed that the same social classes would tend to support either Socialists or Communists, depending on the region, but never split between the two, and when they failed to support the one, would not switch to the other, preferring alternative parties. In other parts of France, neither party had a foothold, and the same social classes that supported either Socialists or Communists in their stronghold regions supported entirely different, and not particularly Marxist, parties. The reason for this split was constantly debated in Todd’s family circle, but no possible explanation seemed to hold water. It was a great mystery. Once Todd began studies at Cambridge, and encountered what we are calling the Continuity School, he began developing a social analysis that perfectly predicted the voting patterns that had been such a mystery in his family’s kitchen debates. France is far from homogenous, and in fact is a patchwork of quite different cultures and family systems. 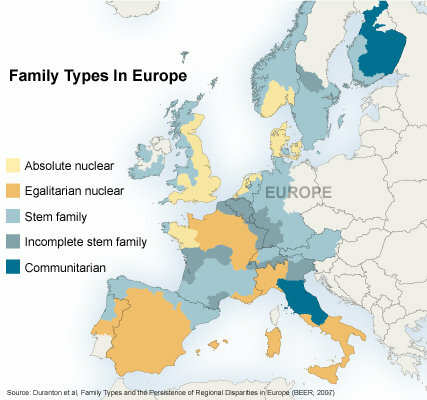 When Todd saw the distribution of the various family systems of France, as established by inheritance rules and customs, he saw at once that both the Communist and Socialist electoral strongholds corresponded to the areas dominated by two distinct family systems. Where other systems prevailed, neither the Communists nor the Socialists could gain any real foothold. You can see how Todd was perfectly primed to generalise the principle from France, and then England, to the entire world. In the course of my Todd readings and meanderings, I probably was told (perhaps by Todd himself in his book about French politics (which I have long possessed (and which I see you can now get second hand for £2.81 (in English)))) that Todd had been raised by baffled and frustrated Communists. But I had not really taken it in. I am at the moment struggling to complete a long piece for Samizdata, about America 3.0 and Emmanuel Todd, and so forth and so on, so as of now, all other bloggings are off. I hope that saying this here will get me finishing this, but fear it may delay things even longer, because that is what often happens when I make promises of this sort. I generally prefer to promise nothing. I took that photo on the same day that I took this photo. Alas, the Butterfly also had to twisted anti-clockwise. 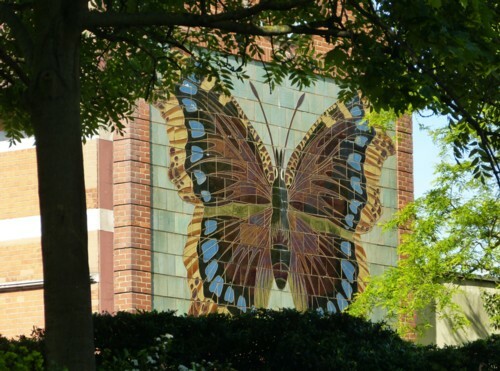 Read more about the strange history of this butterfly here. Apparently that building is now a boxing club. Muhammed Ali - Mr “Float like a butterfly, sting like a bee” - would surely approve. I see you’ve written a great deal on Emmanuel Todd. I have just written a summary of his big history book, L’invention de l’Europe. I thought you might find it interesting. I also see you have the impression he mainly criticizes the U.S. for being a “hollowed out,” financialized “fake” economy. In fact he is incredibly critical of the eurozone, for that very reason, which he argues is responsible for the hollowing out, dysfunction and financialism of the French and peripheral European economies. All the best, and feel free to share if you write anything new on Todd. My Twitter. I discuss him a fair bit on my Twitter feed as he offends many with his criticism of Germany and euroskepticism. Otherwise I just wrote this short piece on Todd and the euro from a while back. This I have now read. Very interesting, and I think very right. Interesting parallel between the Euro and the Algerian War. Things appear to be really motoring on the Todd-stuff-in-English front. At last. America 3.0 gives readers the real historical foundations of our liberty, free enterprise, and family life. Based on a new understanding our of our past, and on little known modern scholarship, America 3.0 offers long-term strategies to restore and strengthen American liberty, prosperity and security in the years ahead. America 3.0 shows that our country was founded as a decentralized federation of communities, dominated by landowner-farmers, and based on a unique type of Anglo-American nuclear family. . . . The two American guys in question are Jim Bennett (of Anglosphere fame) and Michael Lotus, who are also Chicago Boyz. Others are talking about this also. America 3.0 will be on my Essential Reading list just as soon as I can get my hands on a copy. Actually it’s by Youssef Courbage and Emmanuel Todd. And it’s not that new; it was first published (in French) in 2007. But it has just been made available in English. And it is exactly the Todd book that, for several years now, I have most been wanting to read. It is entitled A Convergence of Civilizations: The Transformation of Muslim Societies Around the World. If it is as interesting as I hope it is, this book could finally enable Todd to make his long overdue breakthrough into the English speaking world. And it is, as Instapundit is always saying, in the post. A few months back I discovered that there were other Emmanuel Todd fans out there besides me, notably Lexington Green of Chicago Boyz, and James C. Bennett. Emails were exchanged, and I met up with Bennett in London. Very helpful. Here is a big moment in what I hope may prove to be the long overdue rise and rise of Emmanuel Todd in the English speaking world. Todd is quoted here by Lexington Green, and then linked to from here. Yes indeed, Instapundit. Okay, this is because what Todd is quoted saying happens to chime in with what Instapundit wants to be saying, but … whatever. That’s how Instalaunches work. A double movement will assure the advancement of human history. The developing world is heading toward democracy — pushed by the movement toward full literacy that tends to create culturally more homogeneous societies. 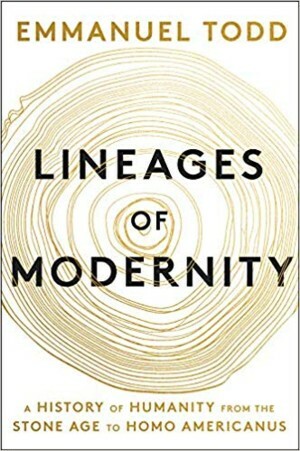 As for the industrialized world, it is being encroached on to varying degrees by a tendency toward oligarchy — a phenomenon that has emerged with the development of educational stratification that has divided societies into layers of “higher,” “lower,” and various kinds of “middle” classes. However, we must not exaggerate the antidemocratic effects of this unegalitarian educational stratification. Developed countries, even if they become more oligarchical, remain literate countries and will have to deal with the contradictions and conflicts that could arise between a democratically leaning literate mass and university-driven stratification that favors oligarchical elites. Todd’s book, despite its flaws, is full of good insights. This passage was prescient. The Tea Party (“a democratically leaning literate mass”) and it’s opponents, the “Ruling Class” described by Angelo Codevilla, ("oligarchical elites") are well-delineated by Todd, several years before other people were focused on this phenomenon. This may cause a little flurry of Toddery in my part of the www. Not all of it will be favourable, to put it mildly, because the book quoted is fiercely anti-American, and totally wrong-headed about economics. Todd is one of those people who insists on dividing economic activity into “real” and “unreal” categories, solid and speculative, honest and delusional. Todd’s problem is that he imagines that the making of things that hurt your foot when you drop them is inherently less risky than, say, operating as a financial advisor or a hedge fund manager. But both are risky. It is possible to make too many things. Similar illusions were entertained in the past about how agriculture was real, while mere thing-making was unreal. Todd believes that the US economy is being “hollowed out”, with delusional activity crowding out “real” activity. The problem is that Todd is not completely wrong. Economic dodginess was indeed stalking the USA in 2002. But the explanation for the processes that actually did occur and are occurring, which are easily confused with what Todd said back in 2002 was happening, and which will hence make him all the more certain that his wrongness is right, is not that manufacturing is real and financial services unreal, but that for Austrian economics reasons (Todd appears to have no idea whatever about Austrian economics), all dodgy and speculative activities, most emphatically including dodgy manufacturing ventures, have been encouraged by bad financial policies. Todd also seems to imagine that only the USA has been guilty of such follies. If only. Such are some of the flaws in this book that LG refers to. But none of that impinges on Todd’s fundamental achievements as a social scientist, which I have long thought ought to resonate in my part of the www. This should help. Just to say where I come from, in case strangers are passing by (welcome, by the way): I’m an atheist, for most of the usual atheist reasons, and an atheist who prefers Christianity to Islam, for most of the usual human reasons. Were a time traveller/historian from the future to reveal to me that Islam had indeed been defeated (setting aside for the time being just what “defeated” might mean), I would expect him/her to add, at some point in our (I hope) quite prolonged discussions, that Christianity had played a big part in this excellent outcome. Religion seems to me to be a part of human nature, which is not to say that all humans seem to need it like we all need air, food or drink. It’s just that a lot of us seem to. As an atheist I am resigned to this. All the arguments that convince me of the non-existence of God are not so much wrong, to a religionist, as beside the point. The point being that they really need their religion, and that’s the truth that matters to them, not people like me explaining the factual implausibility of spaghetti monsters or orbiting teapots (two favourite atheist inventions). But, say other commenters in the same thread, Muslims are more than replacing themselves, by having a higher birthrate. Many things could be said about this. I will confine myself to one (or maybe it’s two followed by a deduction), which is that whereas the flow of Muslims out of Islam and into Christianity can be expected to continue pretty much indefinitely, very possibly becoming a stampede once converts to Christianity are able to be more public about the process, the current high birthrates of many Muslim countries can be expected, in due course, to moderate. All modernising countries experience a big bulge in their birthrates, but this never lasts, or such is my understanding. If the above is right, that’s very good news for Christianity and very bad news for Islam. And people like me, who would merely like to see Islam defeated, can just relax and be patient and let history take its course. Okay, pessimistic cup-half-empty commenters, off you go. Tell me this is all wishful thinking. If you feel like it. These Islam postings here are really just me thinking aloud. If others join in fine, but if not, fine too. And speaking of Todd (see below), I really was speaking of Todd last Monday night, into Patrick Crozier‘s portable computer. Our conversation (click here to hear it) lasted just under half an hour. Like Patrick I felt, immediately after our conversation had ended, that it bordered on the shambolic, but it was his thing, so I said, if you think it’s okay, okay. Listening to it today, I find that I agree with Patrick. It is okay. Yes, I faff and fluff and fudge, but as I explain, what attracts me to Todd’s grand theorising is precisely its simplicity. In essence the story he tells is very straightforward. Anthropology is ideological destiny. Literacy sparks the ideological explosion and then, when the rubble has settled and the blood has dried, it is economic development. (Also fertility control.) However, the ramifications of this story are almost unimaginably complex. As, presumably, if I can find such, is any academic debate about the story’s truth or falsehood (of combination of the two). So, don’t blame me for not talking very fluently about the fine detail. If I could link to some exhaustive scholarly reaction to Todd, I would be mightily relieved. But, on the internet, I have found only tantalising rumours, and cold trails.